If you are in business you will hopefully already appreciate the high value of customer loyalty. While of course it is great to be continually attracting fresh, new customers and clients these can cost more to acquire and don’t spend as much as loyal, repeat customers, who will also tend to be valuable brand advocates. Customer retention means long-term clients who will help your business grow and keep your profits flowing. The fundamental, key reason why customers come back for more is that they are satisfied with your business, the products they have purchased, the service they have received and, of course, the prices they were charged. Customer satisfaction is absolutely paramount when considering customer retention. There are basically four clearly defined levels of customer satisfaction. Each level is based on the degree to which your business is meeting customer expectations. The higher the level that your business is able to achieve then the more you will build customer loyalty which will support greater success. Let’s examine each of these levels. At the very basic level is meeting your customer expectations. If you are not meeting their fundamental expectations, most of the time, then you are unlikely to stay in business. If you are meeting their basic expectations then your customers will be happy and satisfied. But you may not be able to retain these customers if a competitor offers an appealing alternative that goes beyond meeting their basic expectations. Another key risk, when you are operating at this level, is that if you fail to meet a customer’s expectations, even only once, there is a strong chance they will take their custom elsewhere. Operating a business at this level of customer satisfaction means that your business is surviving, but it may not be thriving. The next level up in this customer satisfaction hierarchy is exceeding your customer expectations. By surpassing their basic expectations you will achieve a higher level of customer satisfaction. For example, providing a remarkably fast super-friendly and helpful service is one way to exceed basic expectations. 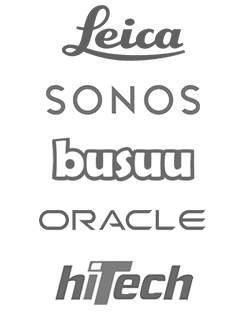 Another is to provide products and services which do more than your customers expect. By providing more than your customers expect you will be fostering loyalty to your brand. Your retained customers will come back time and time again and what’s more, they are often willing to pay a little bit more for top quality service and support, which is great for your business. 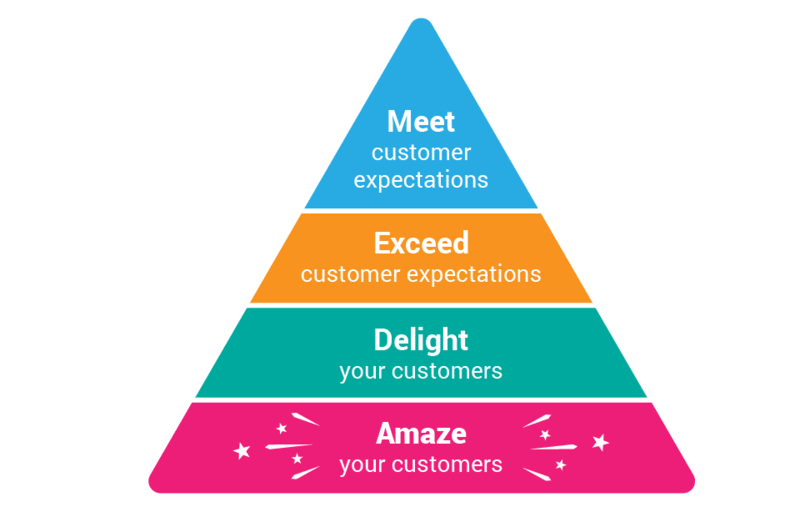 The first two levels in this customer satisfaction hierarchy have addressed basic customer expectations and how it’s beneficial to exceed them. This next level goes that little bit further to actually put a smile on your customers’ faces. In order to delight your customers and make them smile you need to touch them on an emotional level. If you give your customers a genuinely delightful experience you will have firmly hooked them making it very difficult for a competitor to attract them away. To delight your customers you need to show that you really care about each of them. There are many ways to delight customers such as rewarding loyalty with gifts, discounts, special offers or loyalty points. You may be wondering where you go next after having achieved a high level of customer satisfaction and widespread delight amongst your client base. At this top level of customer satisfaction you need to genuinely amaze your customers. By truly amazing your customers you will position your business for great success. With a little thought you will no doubt be able to come up with many ways in which your customers would be amazed. For example, great new product features which go way beyond what they expected. Or maybe simple but personal hand-written thank you notes. Free guarantees is another easily implemented way to potentially amaze your customers. By regularly surveying your customers, getting to know their expectations and continuously monitoring their customer satisfaction levels you can move your business up the customer satisfaction hierarchy, drive brand loyalty and create a very high level of valuable customer retention.